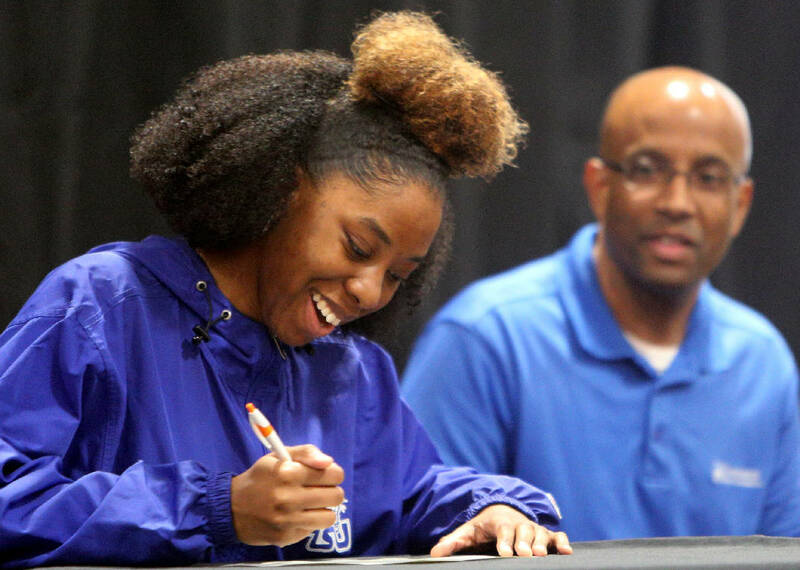 Lacara Bell signs a certificate stating she will be attending Tennessee State University as Tennessee State assistant director of admissions David Harris looks on during the Chattanooga Girls Leadership Academy's College Signing Day event Thursday, May 3, 2018 in the gym at CGLA in Chattanooga, Tenn. Bell plans to major in biology. Aareon Reed is going to study social work. She was inspired by one of her mentors, a psychologist, and decided that her first thought to major in engineering wasn't for her after she completed her senior project. Frida Uwimana is looking forward to the independence and ability to make her own schedule that being a college student allows. KaDarrell Howell is ready for a fresh start. These are the goals and hopes of some of the 25 seniors graduating from Chattanooga Girls Leadership Academy this month. The girls were celebrated Thursday at the school's inaugural College Signing Day. Representatives from some of the colleges and universities where the students have been accepted, including the University of Tennessee at Chattanooga, Chattanooga State Community College, Tennessee State University and Berea College in Kentucky, were present to hand the girls T-shirts, certificates and collect their signed commitment forms. "This is a big moment," said Ashley Hale, the school's college access adviser. "The next four years in college is going to be an amazing experience." The signing day was partially inspired by the more familiar events held for athletes when they commit to play for colleges, but also reflects the school's commitment to its students. "We have always worked to instill confidence in our girls and encouraged them to see themselves as successful, educated women," said Justin Booker, the school's chief operation officer, in a statement. "Each day we welcome bright and capable girls to CGLA, and it's been so amazing to witness them realize that." Many of the students have attended CGLA since they were in sixth grade, and the members of this year's graduating class were seventh- graders when Elaine Swafford took over as executive director of the school and helped turn it around. In 2012, CGLA had been added to the state's priority, or low-performing schools, list, but by 2017 it was receiving national recognition for student achievement. The school's rigorous curriculum and high standards are meant to prepare students for college. Every student makes a commitment to go to college when they start at the school in sixth grade. "CGLA gave the skills I need," Reed said. "I feel like this school has really prepared me for college. I know I will get there and it won't be as hard because I've already done it." Swafford said the signing day was a culmination of all that students and staff have worked toward to get the girls ready. "I've been with this class since they were in seventh grade I've watched them grow academically and into young ladies and watched them mature," Swafford said. "It's been an amazing journey to push them to new heights academically, ones even they didn't know they could get to." Reed's mother and mentor also were present at the signing day to support and celebrate. Through the school's Empower Mentoring Program, every girl at the school has a mentor from businesses and organizations in the community. Reed said her mentor, Candace Bell of EPB, as well as the entire team team, was invaluable to her and especially helped her with her senior project. Most of CGLA's students come from surrounding communities of concentrated poverty. Most of them are students of color and often times they enter the school underperforming in reading and other subjects. Many of them also experience challenges outside of the classroom — yet the girls are also determined to succeed. In 2011, Howell's older sister got custody of KaDarrell and her younger brother. Her sister had to forgo a full ride to college to take on the responsibility and care for her younger siblings. Janel Jones worked throughout her high school years, helping her mother pay the bills, but had to quit her job this year to finish. It's been hard on her mother, Jones said, especially when bills can't get paid. Uwimana also had to take on responsibilities in her family this year, she said. Meanwhile, Victoria McWhorter, who is bound for the University of Tennessee, said she struggled with her mental health throughout high school at CGLA. "Mental health problems were hard for me to overcome," McWhorter said. "But this year, when I was voted class president, that was a big moment for me." Her aunt, Cathy Goldthreat, who also attended the ceremony, said she was proud of her and looking forward to what she would accomplish at UT studying film. "When she puts her mind to something, she is going to be good in it," Goldthreat said. School administrators told the students that Thursday, and even graduation on May 11, weren't the end of their relationship. "Our commitment doesn't end today," said school principal Maryo Beck. "It doesn't end when you go to college. We are committed to you throughout the entire education process." All 350-plus students at the school attended the signing day, and as the ceremony wrapped up, assistant principal Kelli Fulton asked the crowd, "Who will be up here in the future?" The gymnasium thundered with cheers.